Ruth Murphy of BT presents the Technology Junior Group third place award to Amy Fallon and Andrea Whyte from Athlone Community College. It was a successful outing for Westmeath schools at last weekend’s BT Young Scientist and Technology Exhibition, with eight separate prizes being awarded to local students. Two Athlone groups picked up Special Awards at the annual event: Athlone Community College students Megan Coolahan, Ceara Mulry, and Clodagh Moxham won the Bord Bia Origin Green Sustainability Award for their study entitled ‘MCPA pesticide in drinking water’, a project which was also ‘Highly Commended’ by the judges. The Special Award from UCD College of Social Sciences and Law went to Maeve McMahon and Julie Ryan from Our Lady’s Bower for their project ‘Getting out and about – the Free Travel Scheme and older people’. This project also took first place in the senior Social & Behavioural Sciences category. Athlone Community College was successful in the junior Technology category, with Amy Fallon and Andrea Whyte taking third place for their project ‘To determine the technical feasibility of using machine learning technology to predict when a mobile phone or charger may explode’. A further three Westmeath projects impressed the judges, earning ‘Highly Commended’ status in the awards: Moate Community School students Ronan Murphy and Gerard O’Reilly for their project ‘Can plants lead the way to unleaded soil?’; Marist College students Padraig Mcdermott, Billy Dalton, and Oisín Lough for ‘Get off my tail’; and Meán Scoil an Chlochair, Kilbeggan students Caoimhe Clarke MacMahon, Katie Colton, Chloe Gannon for ‘Does participation in transition year enhance psychological wellbeing for participating students?’. Meanwhile from neighbouring Roscommon, a project by a pair of students from CBS Roscommon was also Highly Commended. Jack Lohan and Micheal Beirne’s project entitled ‘The effects of recent floods on farms in South Roscommon’ is bound to make interesting reading for land owners affected by last winter’s severe flooding. 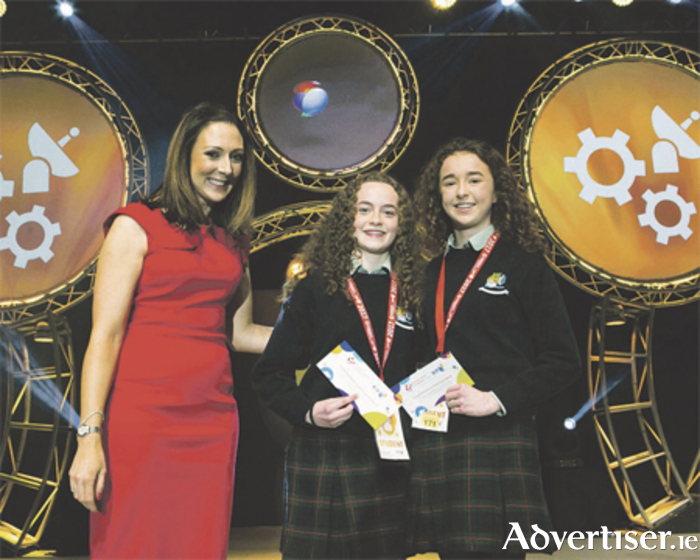 The 53rd BT Young Scientist and Technology Exhibition took place from January 11-14 in the RDS, Dublin. The overall winner was 16-year-old Shane Curran, from Terenure College, Dublin for his project entitled ‘qCrypt: The quantum-secure, encrypted, data storage solution with multijurisdictional quorum sharding technology’.